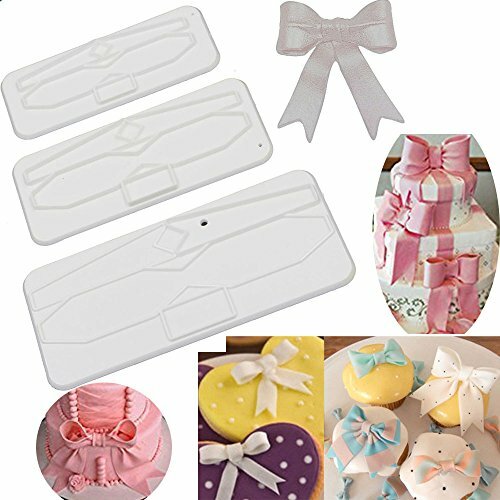 ribbon bowknot bow tie cutter set cookie impression mold plastic cutter fondant sugar paste cutter gum paste Modelling Tools for Cake Cupcake Toppers Decoration Pack of 3 by Anyana at Seasons Cafe Bakery. MPN: 1. Hurry! Limited time offer. Offer valid only while supplies last. The moulds use only the 100% food grade durable to create mould used for a variety of mediums. Non stick easy to use, can be reused over and over. View More In Sculpting & Modeling Tools. The moulds use only the 100% food grade durable to create mould used for a variety of mediums. Non stick easy to use, can be reused over and over. These moulds will produce figures that look hand made, making it quick and easy for beginners. The experienced cake decorator will be able to alter and adapt the finished figures for their own designs. 1. Made of high quality silicone material, approved by FDA and SGS. 2. Wide range temperature tolerance: -40~230oC. 3. Tasteless, non-toxic, dust resistant, durable, no permeate and easy to clean. 4. Be safe to use in ovens, microwaves, washing machine and refrigerator. 5. Be apt to be disposed. 6. Microwave and freezer safe 7.Color: As pictures show, will randomly pick. 8.Suitable for making cake, bread, mousse, jelly, prepared food, chocolate, etc. Random Color: pink or blue or purple or Green Rating of temperature: -40 centigrade to+210 centigrade High quality and it is easy for using and cleaning.It is Soft and easy to use . Note:this mold may be not as large as you imagine;please pay attention to size info before you make payment. Make a classic bow in 5 easy steps Roll out gum paste,cut out bow,Loops: 2.Follow diagram below.Fold part "B" and "C" Attach to meet point "A". Knot: 3.Attach part "D" neatly over join "A" Tails: 4.Secure "E" and "F" together.Attach the Bow to the tails. 5.To give the Bow a sheen spray with edible lustre. Features:It's durable,washable,reusable,easy to operate and clean. The pattern of cake cutter decor is the bowknot,can made the cake more beautiful. Attractive styling and easy to operate mold,is your good helper for baking DIY. Perfect for decorating cake,fondant,paste,sugar,cookie,sugar and so on. If you have any questions about this product by Anyana, contact us by completing and submitting the form below. If you are looking for a specif part number, please include it with your message.